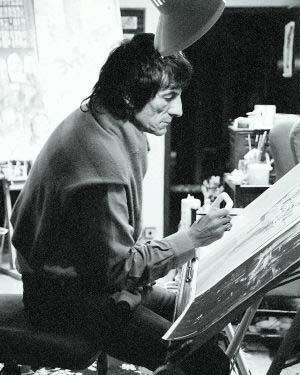 LEGENDARY rock guitarist Ronnie Wood was nine when he sold his first painting. Which settles that old debate over which came first - the art or the music. "I was quite young when my first painting was properly recognised," Ronnie tells CityLife as we chat about his forthcoming exhibition. "I won a TV competition - my family and I were having dinner at home, and there was my painting on the telly!" From Ronnie's animated reaction - some 50 or so years on - it was clearly a moment of great pride in the Wood household. Especially so for Ronnie, who joined a long line of arty siblings (although famously was the first to be born on dry land). "I always looked up to my brothers, Art and Ted, both musicians and painters themselves. Since I can remember, I wanted to do exactly what they did and so I followed them to art school. "There wasn't one moment where music took over. In my life and forever, art and music have been intertwined. Music is such a part of my life and my life experience that it is ingrained into how I see the world, and how I express what I see through my art." Portraiture - of subjects and self - are regular features of his work, and so it's no surprise when Ronnie reels off the likes of Caravaggio, Goya and William Orpen among his influences. He's nicknamed Ronnie Rembrandt by friends and, in many ways, it's clear why. An expressive painter of contemporary figures, Ronnie admits he is "absolutely fascinated" by the human form, in particular his wife and regular muse Jo. But self-portraiture, he says, is an altogether different, "psychological" experience. "Painting someone else, you paint from their outside to reflect their inside," Ronnie explains. "It is certainly not objective, but there is a bit more distance to the subjectivity. For myself there is no separating the two, I paint as I see and feel." But equally, Ronnie loves to "get out into the wet fields" of Ireland and paint landscapes, and to try new techniques with mixed media. "I enjoy oils, but I also really like just sketching ink on paper. The simple lines and techniques allow you to explore subjects incredibly deeply. "I would love to work more on sculptures, maybe even work with iron. I haven't been able to up to this point - I can hardly start carting around iron in my painting kit while I'm on tour!" laughs Ronnie. Up to this point? Is music finally giving way to art, CityLife wonders "This week, the art is coming first. That being said, music is far from over - as soon as we receive marching orders, we will be back out there again."